The beginning of spring is also the beginning of riding season for many ATV enthusiasts—the start to whizzing along wooded trails, and hearing the thrum of the engine as the wind whips through your hair. Unfortunately, where there's fun, there's often danger—and riding ATVs is no different. This is especially true here in Pennsylvania, where there were more fatal ATV accidents than all but two other states. In the past 25 years, nearly 500 people have died in ATV accidents and as many as 100,000 more were injured. 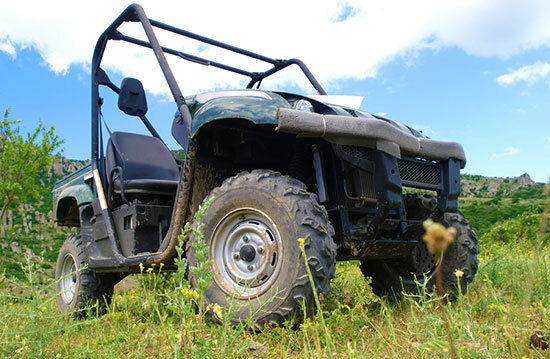 Our ATV accident attorneys want to point out one statistic in particular regarding side-by-side vehicles: They cause twice as many injuries as their traditional ATV counterparts. Because of that, we wanted to be twice as sure you understood the risks associated with that type of off-road vehicle. Side by sides became commercially available in 2003 there have been concerns about their risk of rollovers. Side by sides are small off-road vehicles that accommodate as many as six people that are situated side-by-side. Since they became commercially available in 2003, side-by-sides—small off-road vehicles that accommodate as many as six people in seats that are situated in side by side in pairs—there have been concerns about their risk of rollovers. It's just the way side-by-sides are built: They are narrow and top-heavy—with many models able to travel at speeds as fast as 60 mph. Do a quick search of the Consumer Product Safety Commission (CPSC) website and you'll see that there have been numerous recalls of side-by-sides over the last few years—a safety issue that should be on the radar of any savvy ATV rider. Before considering the purchase of a side-by-side vehicle, check out the CPSC website to ensure the model you're considering is not on the recall list. With a windshield, a steering wheel and adjacent seats, a side-by-side vehicle looks an awful lot like a car—which leads many new users to believe they are just as safe. Side-by-side vehicles lack both the stability and safety features enjoyed by traditional automobiles. Don't let the visual similarities lull you into a false sense of security. When it comes to side-by-sides, it's important to understand your abilities and experience as an ATV owner, and ride accordingly. We hope you have a fun, safe ATV riding season—one that isn't punctuated by a crash that causes you, a passenger, or fellow rider to suffer an injury. But if the worst-case scenario happens, please know that the ATV injury attorneys here at Edgar Snyder & Associates are here to answer all your legal questions. We're available 24/7—call us today for a free case review.